The BBNaija Season 3 started on January 28th 2018 at 7PM, we are now in the fifth week of BBNaija 2018 edition. The second round of Bbnaija vote is here. This time, it seems Lifu would be the next pair to join Ebuka on stage. Recall that three pairs have been sent home already. At that time, Leo and Ifu were paired with Alex and Angel respectively. The former was saved from eviction by K Square, while the latter narrowly escaped, having polled higher votes than VanDee and Printo. 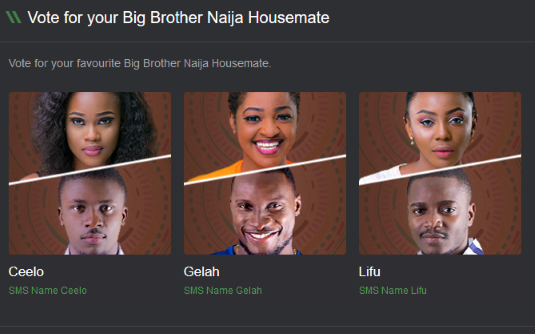 If you are still looking for means of watching the Big Brother Naija 2018 live for free from your Android Smartphone, in this post we will give you a link to download an app for you to enjoy the show, also this post we will show you how you can vote for your favorite Big Brother Naija Housemate (BBNaija 2018). In the first place, I would like us to know that voting is in two categories: FREE and PAID. We will like to let you know that voting via SMS attracts a 30 Naira fee. Also, note that there is no free SMS vote. SMS voting is limited to 100 votes per user. To vote, SMS ‘VOTE’ and your favourite housemate’s name to 32052. To vote for free, you will need to download the WeChat app on your smartphone. Afterwards, add the ID africamagictv or log on to africamagic.tv/bbvote and you are good to go. You may vote up to 100 times for free, but the data charges apply. However, to avoid the stress of searching, you may just scan the QR code from inside WeChat for access to the Official Account. Use the keyword “vote” for quick access to voting. However, please note that the housemates have been paired. This means that the failure or success of a housemate automatically affects his/her partner. Viewers from DStv can watch the Big Brother Naija 2018 Show live on Channel 198 every day until April 2018.